Kulula flights from Durban to Johannesburg qualify to participate in our exclusive travel vouchers for travel reviews program. Email a writeup of your last flight to cheapflights@southafrica.to and we'll send you a discount voucher. Longer, better quality reviews with photos earn more vouchers. Unfortunately Kulula has no direct number for Lanseria airport. Full timekeeping details : Kulula's DUR to OR Tambo flights are 65 minutes, whilst DUR to Lanseria is 70 minutes (so, if you want the very quickest flight, hop on the one to Tambo). Although landing at OR Tambo leaves you with having to face the e-Tolls, which could be dodged from Lanseria. So if you paid R700 Rand for your flight, you're burning R10 a minute. At the end of the flight wait for the announcement from Kulula that they "hope you enjoyed your flight just as much as we enjoyed taking you for a ride!" You're in luck! Durban to Johannesburg is the cheapest flight route in South Africa, and Kulula is often cheapest. 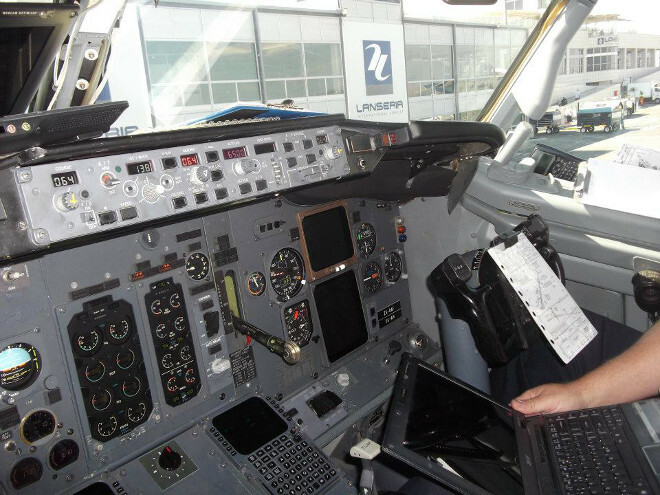 And to book a cheap flight - let your fingers do the walking on the keyboard, and punch your details into the flight bookings tool on the left, and wallah...out will pop details of the cheapest airline. Kulula flights from Durban to JHB are rated 4/5 after 2 flight reviews. Kulula Airlines is the heavyweight champ of the Durban to Johannesburg flight route, with it being the only airline operating flights from King Shaka to both Lanseria as well as OR Tambo International Airport (there are Mango Airlines flights from Cape Town to Lanseria International Airport, but not from Durbs...yet). Still stuck? Don't be shy - ask for Help - we'll be nice, I promise. In fact, our supremely helpful travel agents are itching to show you the best flight deal. 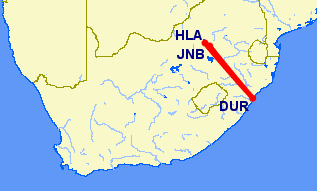 DUR-HLA : King Shaka International Airport to Lanseria International Airport (scheduled to take 70 minutes). Click here to see more details. Counting British Airways Comari and Kuula flights together, Fridays have the most DUR-JNB flights (14) and Saturdays the least (4). The only other budget airline option is Mango from Durban to Johannesburg (and only to OR Tambo, not to Lanseria Airport). Because of the greater competition on the DUR-JNB route, the airfares are usually lower (our research indicates this).